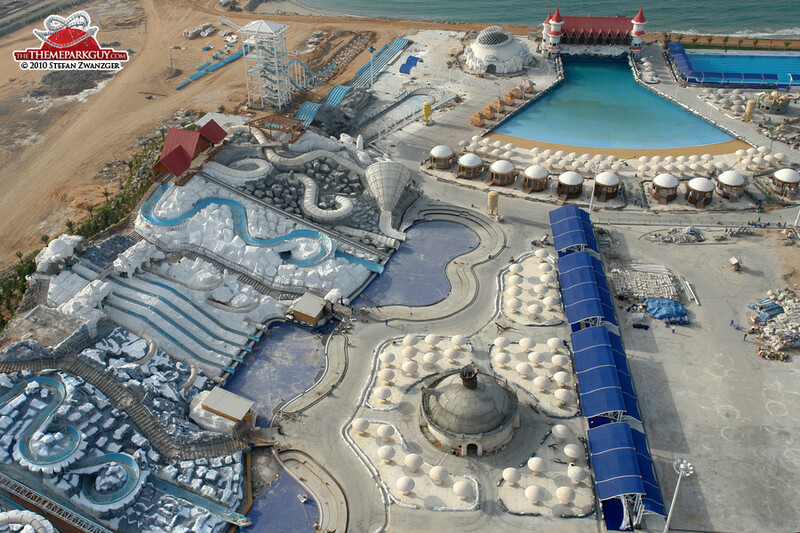 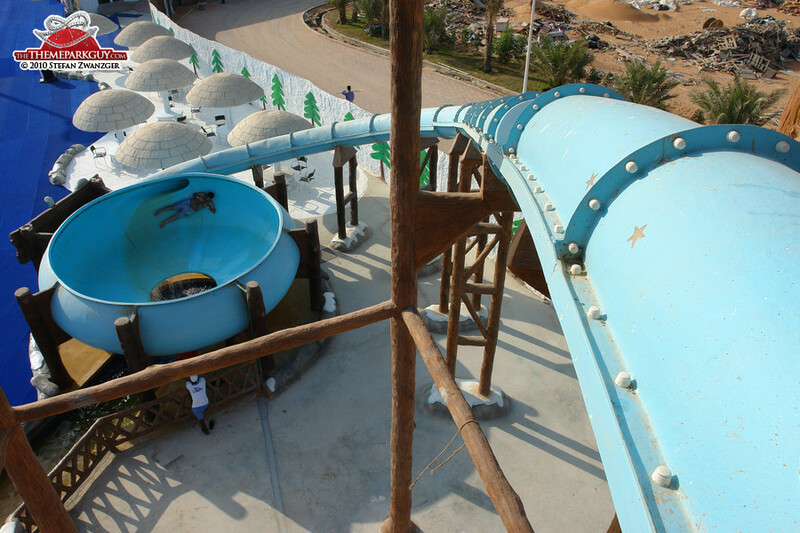 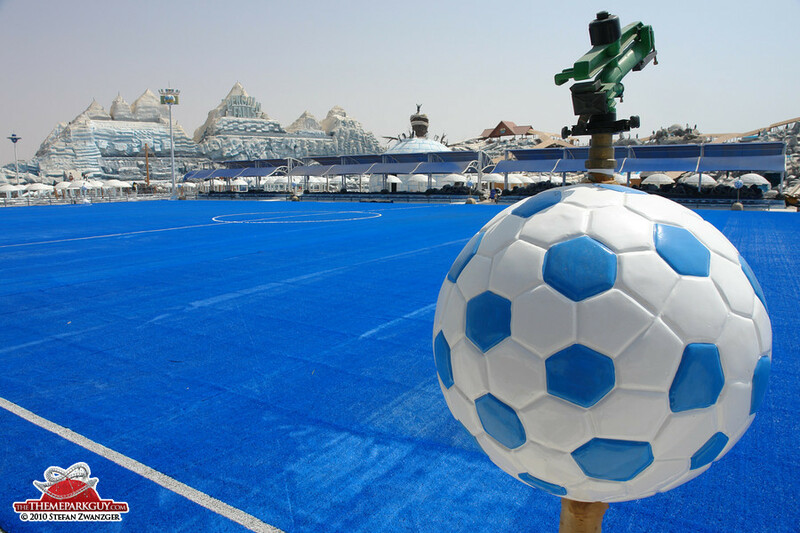 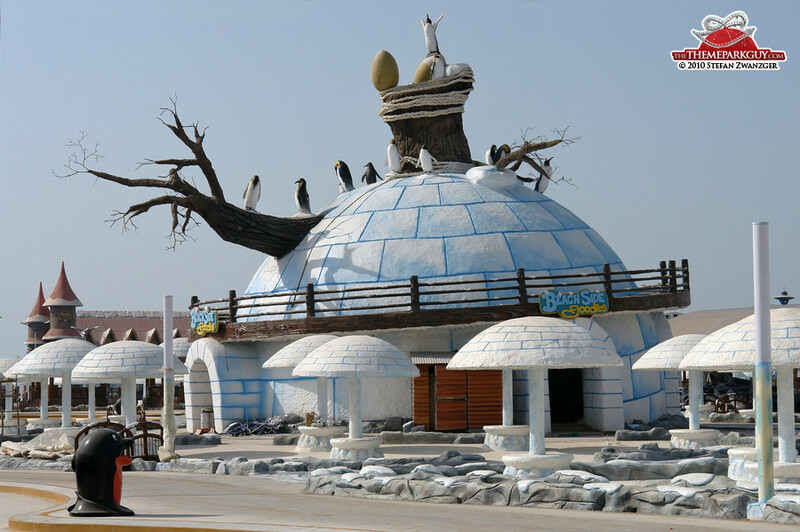 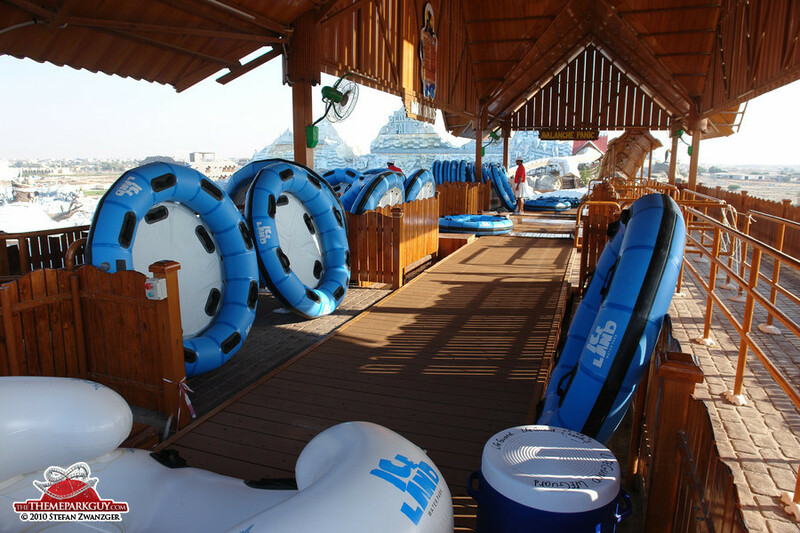 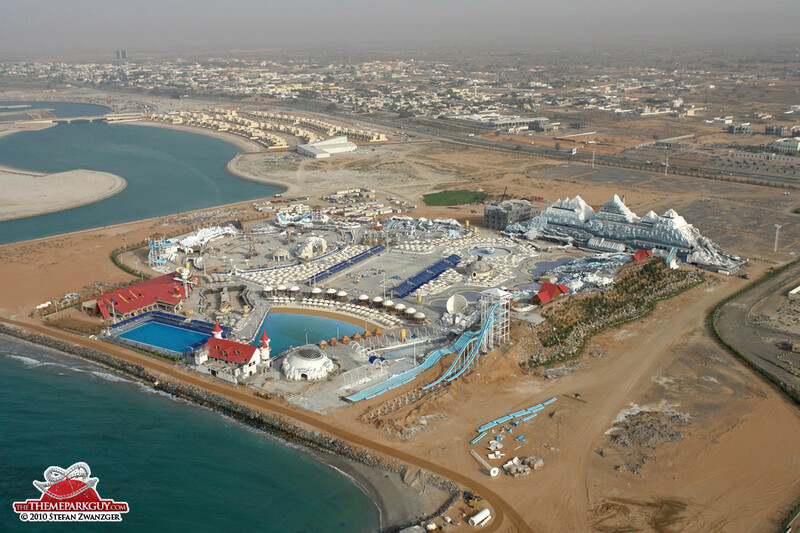 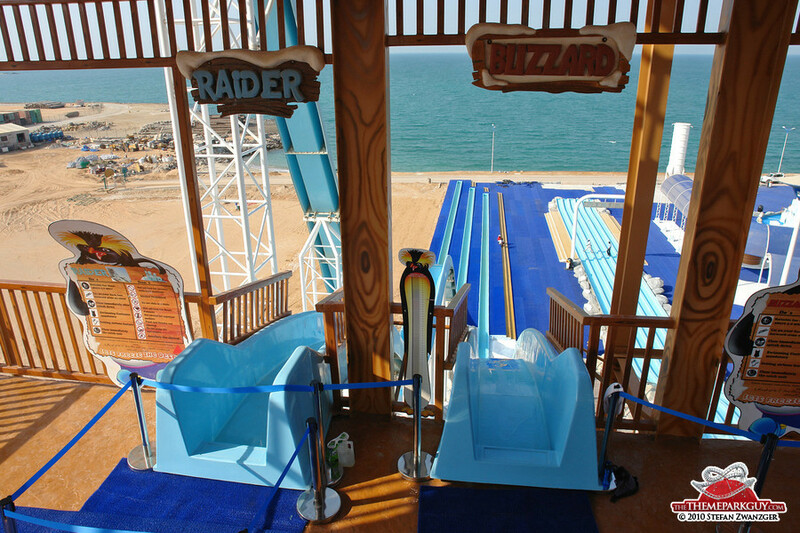 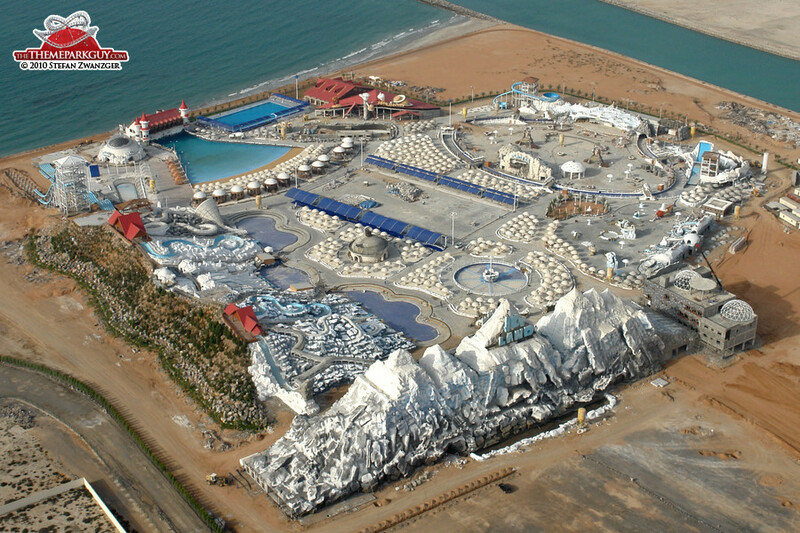 Ice Land Water Park finally opened its doors in September 2010 in Ras al Khaimah, one hour's drive away from Dubai, and I've got good and bad news about it. 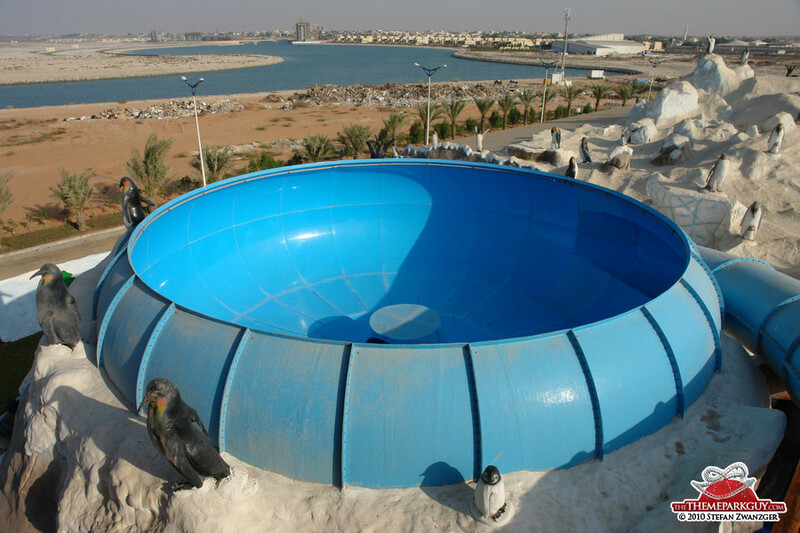 Let's start with the bad news: unfortunately it is noticeable that the body slides (on which you slide without a tube or ring) weren't manufactured to the highest standards. 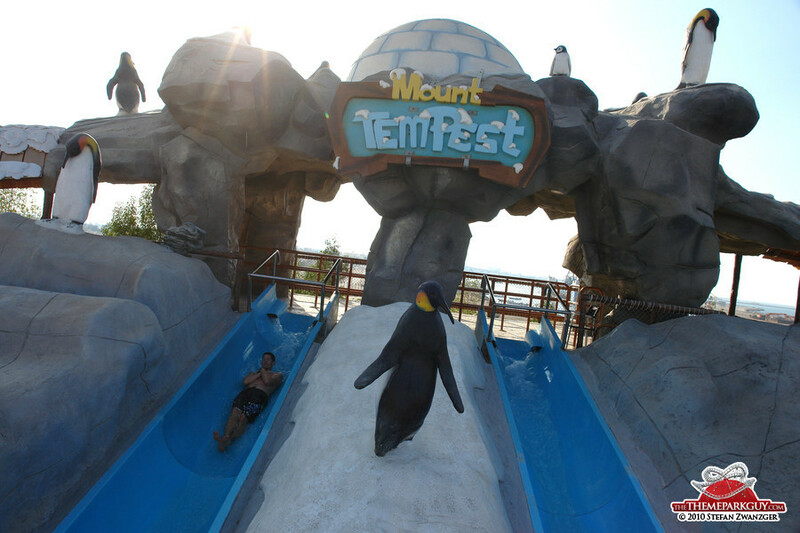 While the slow ones are mildly bumpy (it doesn't hurt, but it does affect the fun factor), the steeper ones snaking out from the waterfront slide tower called ‘Mount Attack' are simply too rough. 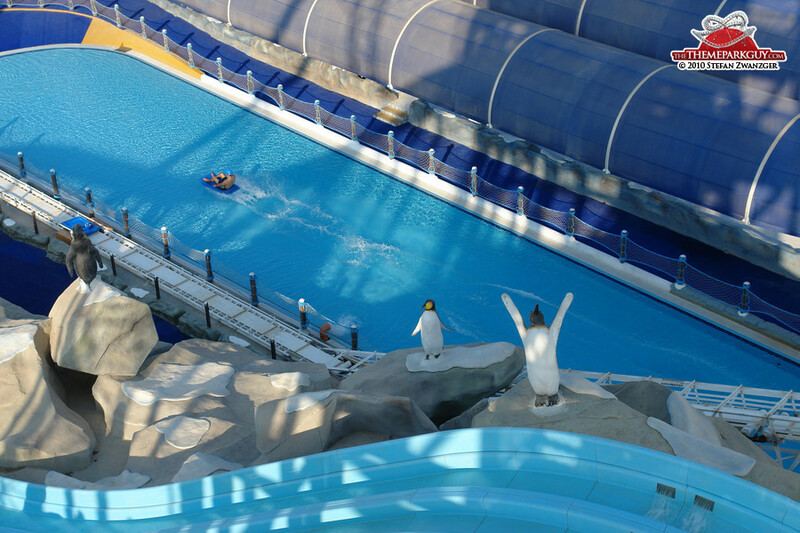 The thin film of water combined with the high-velocity you reach on them may prove painful. 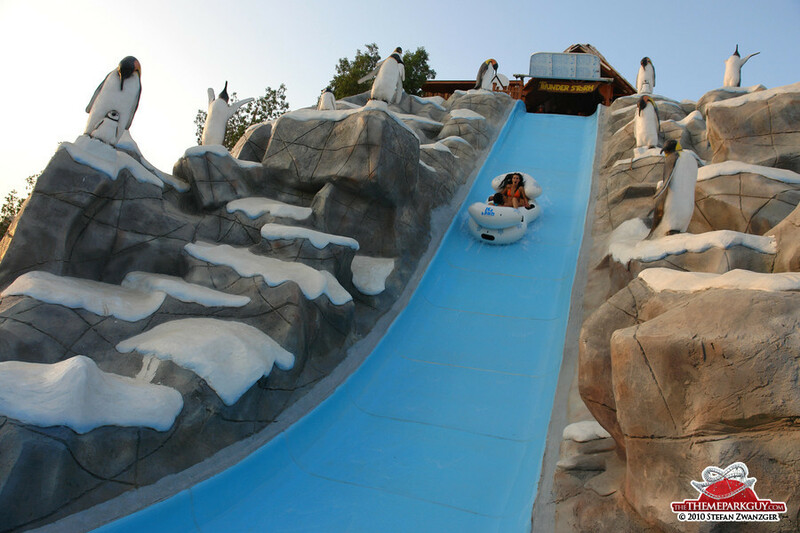 Avoid the highest slide you can spot in the park. 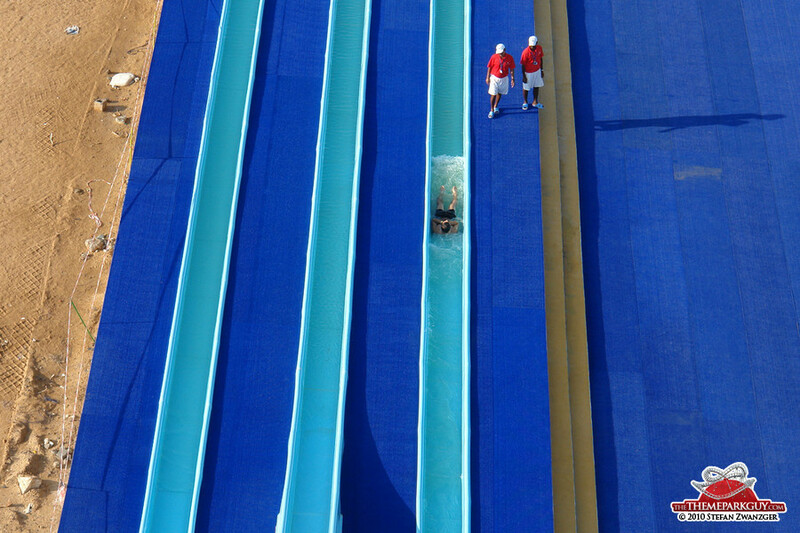 It's not about being bold, it's about having a good day or not. 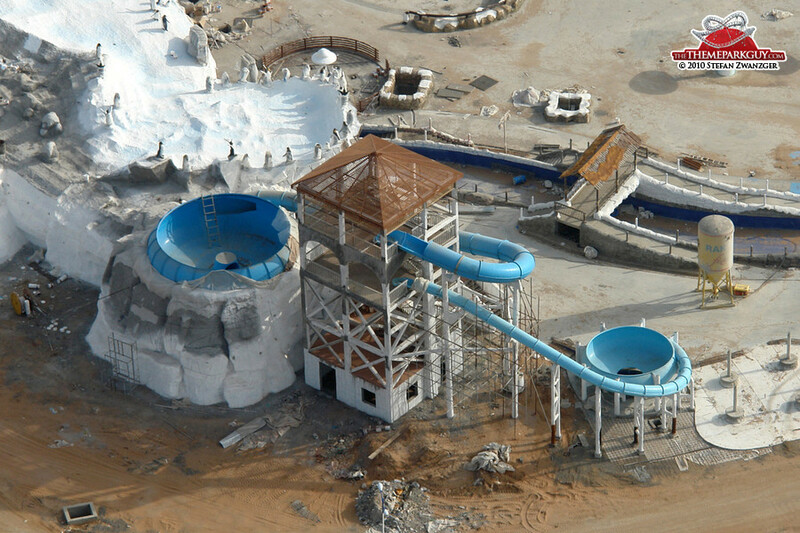 If I was in charge I'd have some top-notch engineers take another look at this tower. 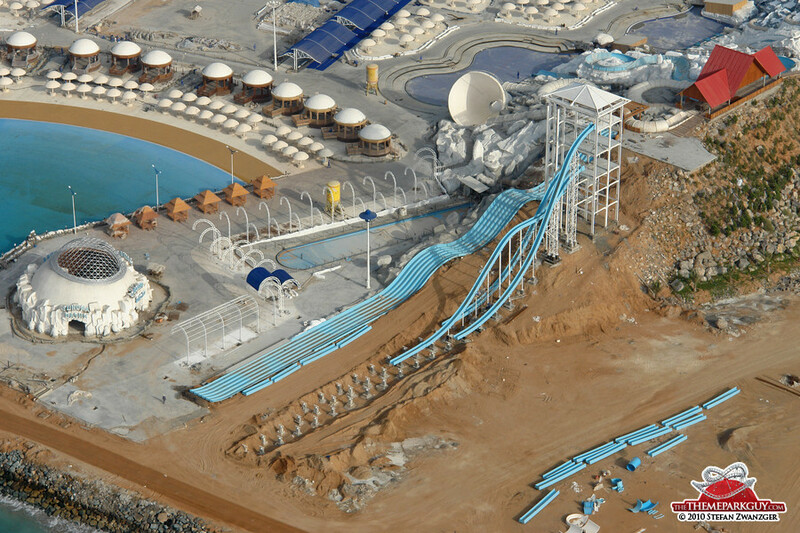 Now the good news: most of the other slides are fun! 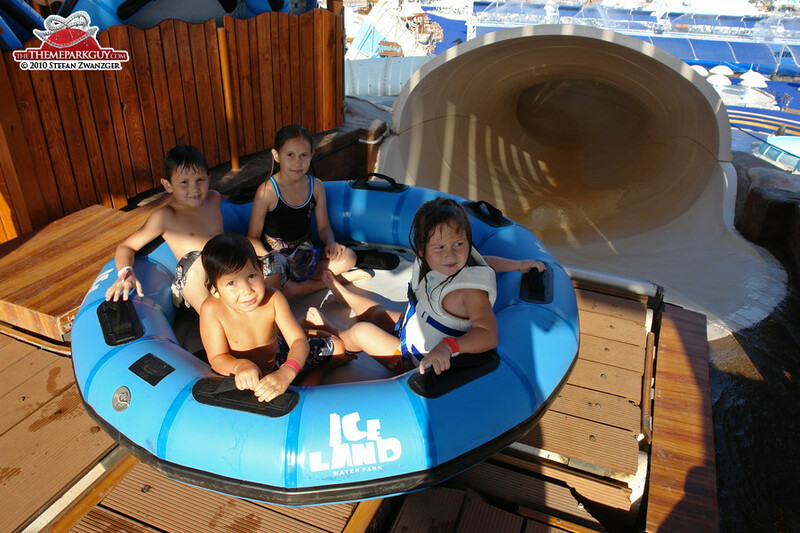 Everything that includes a tube or ring will make you yell with delight. 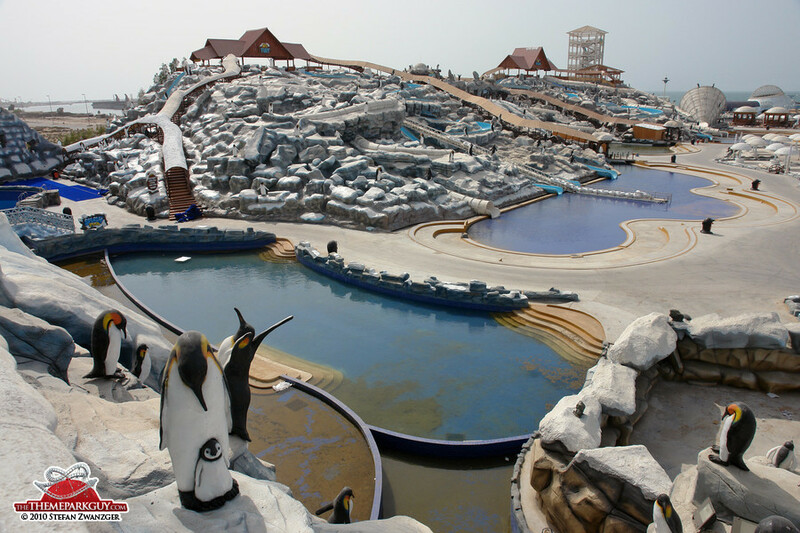 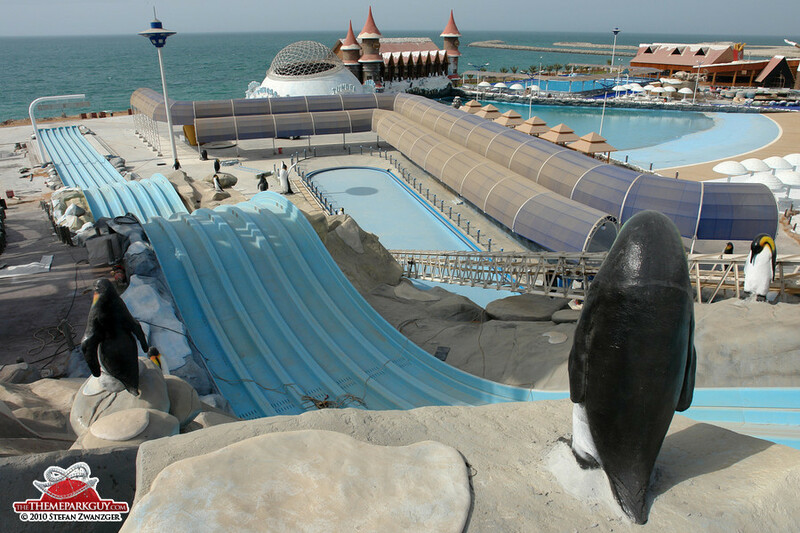 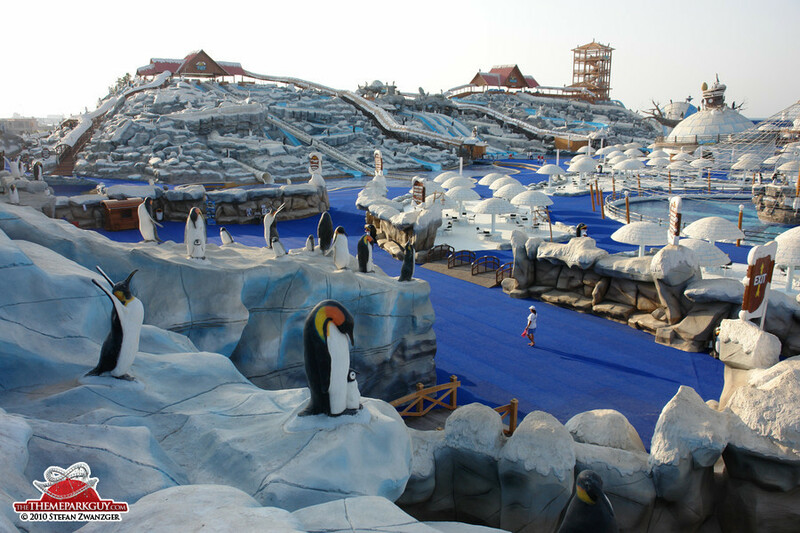 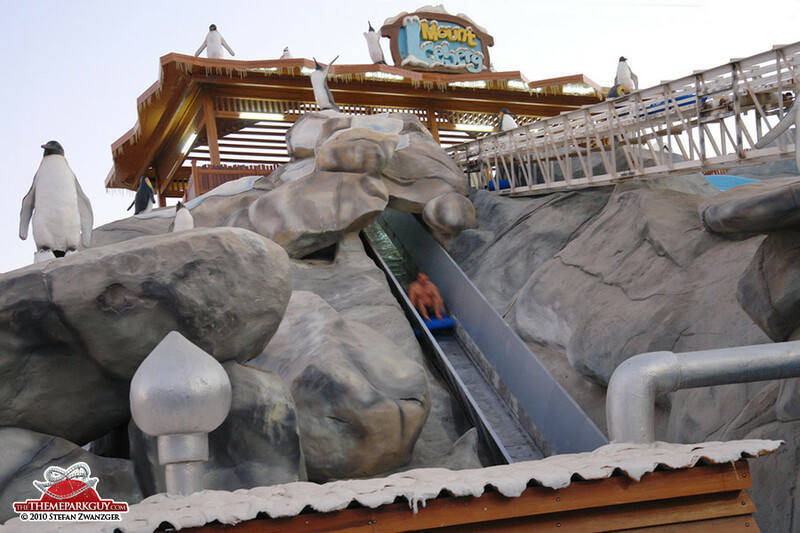 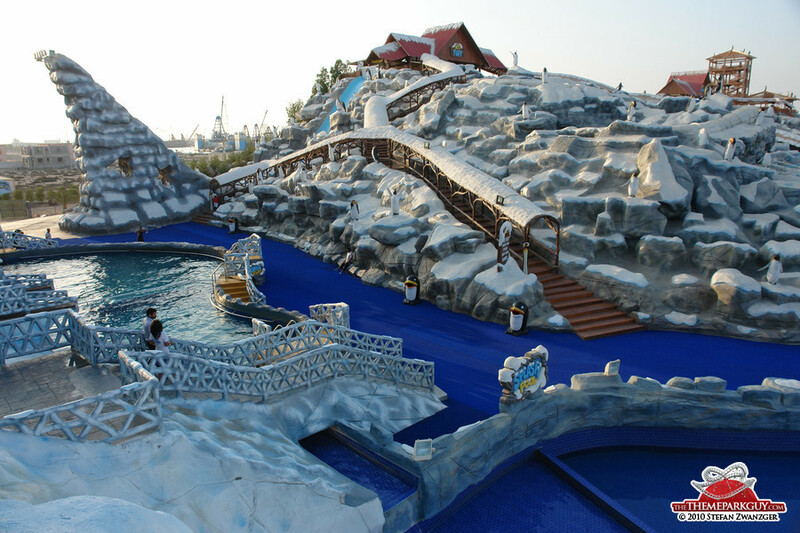 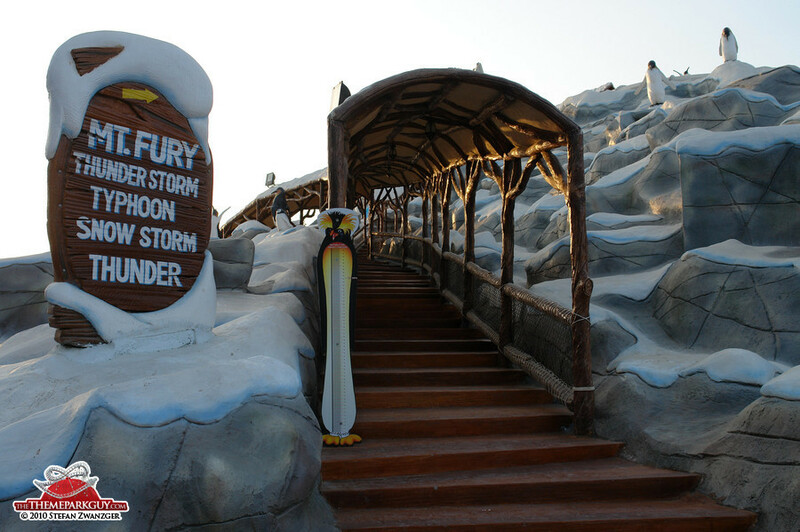 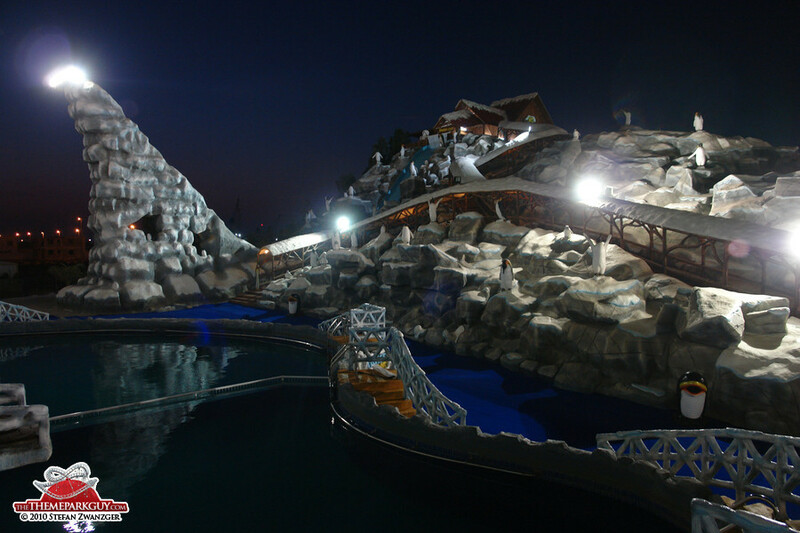 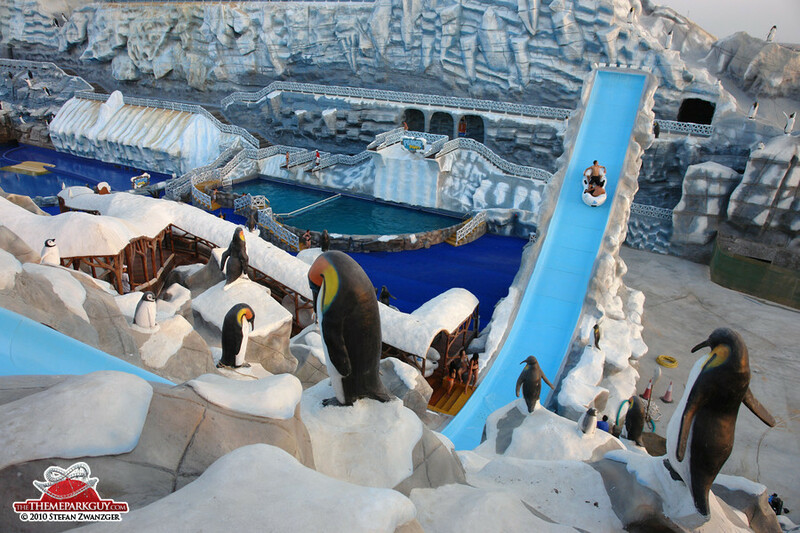 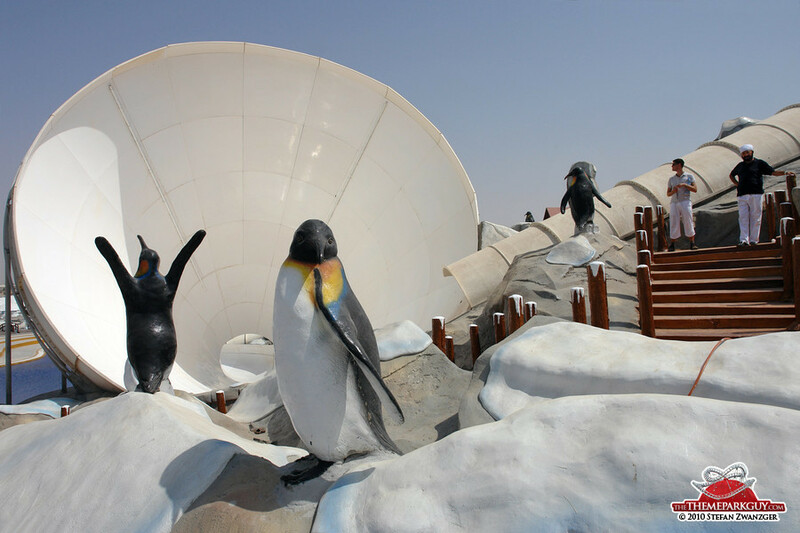 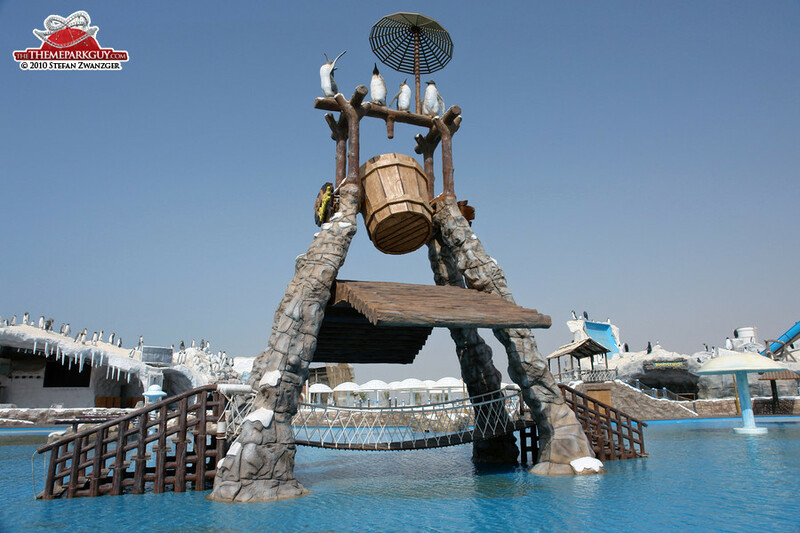 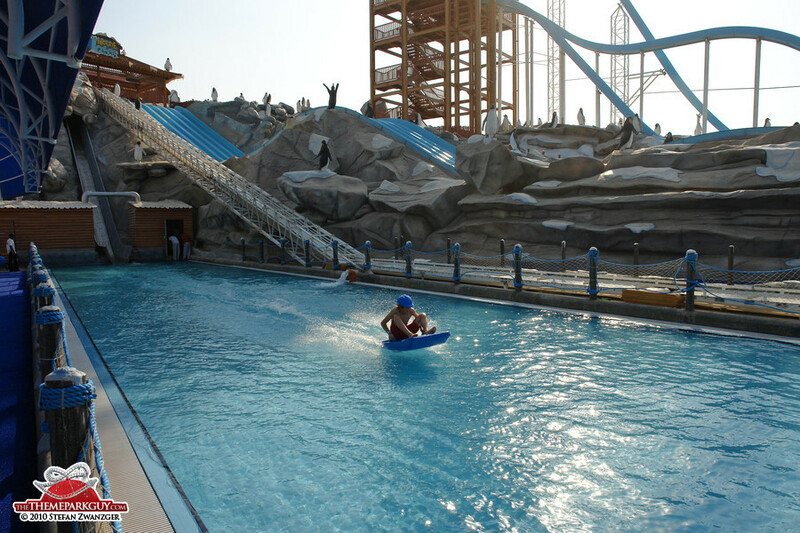 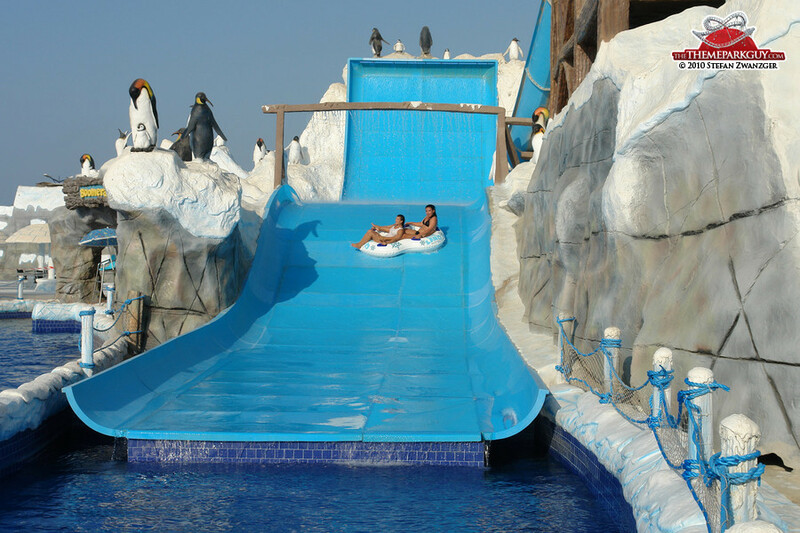 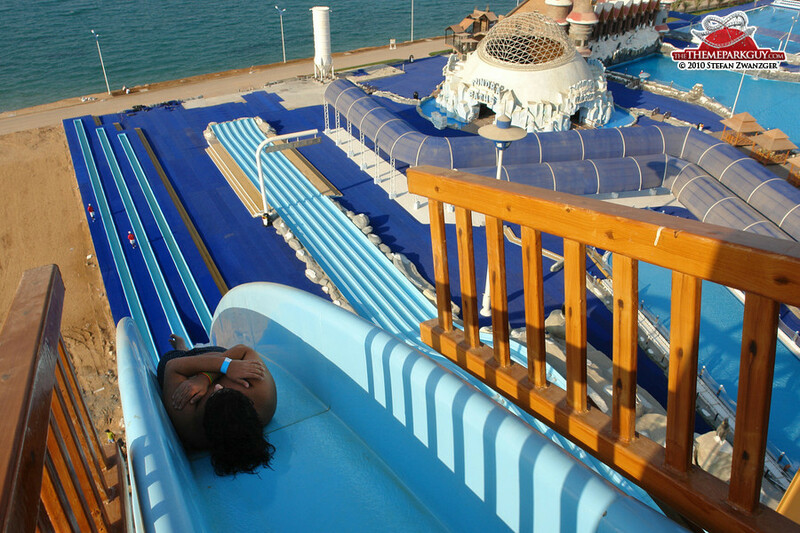 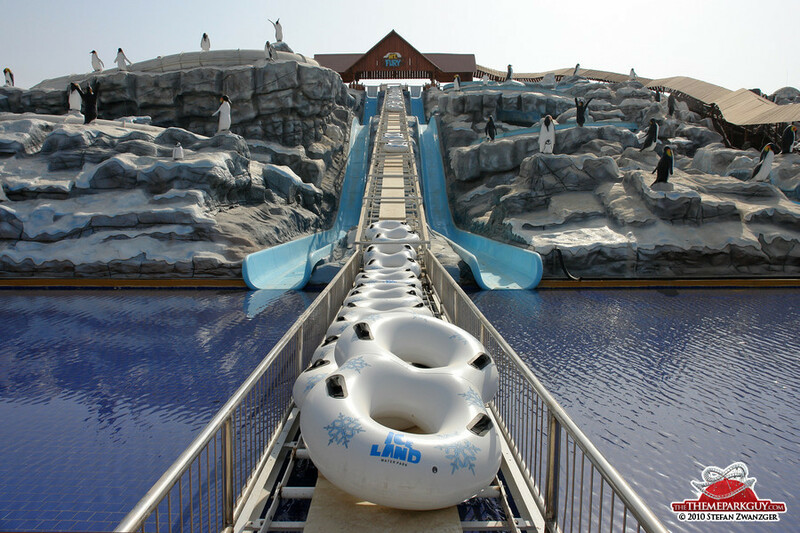 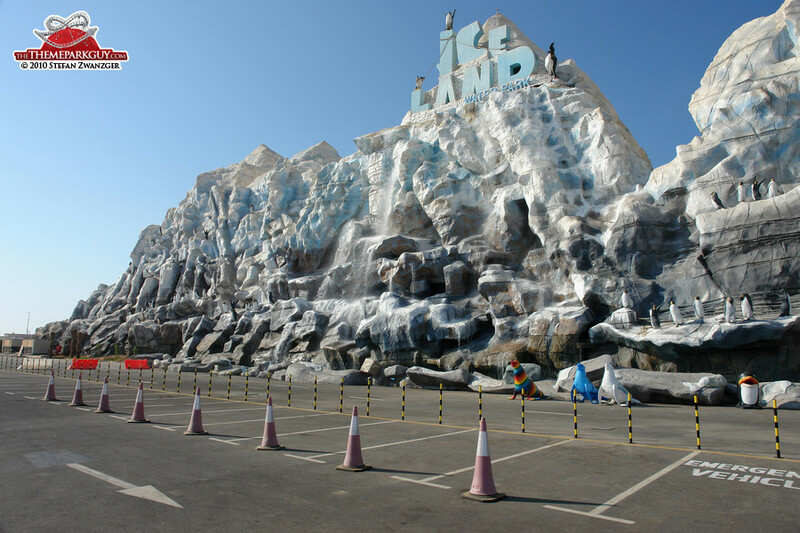 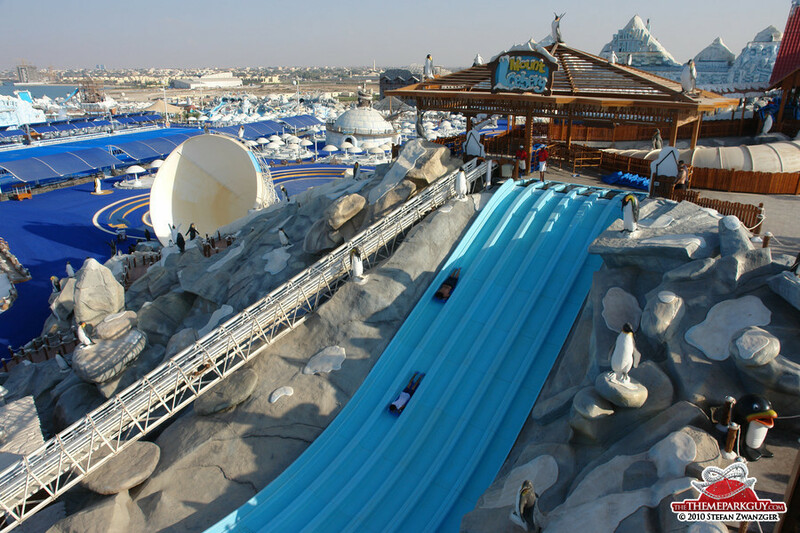 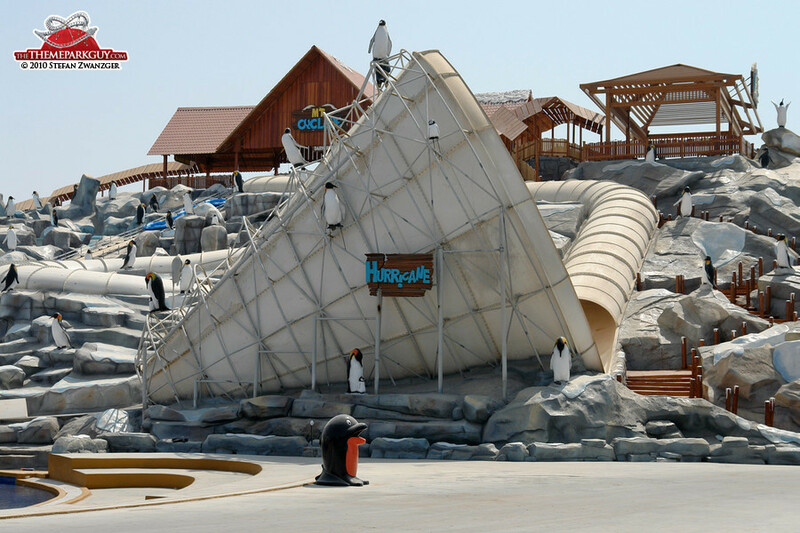 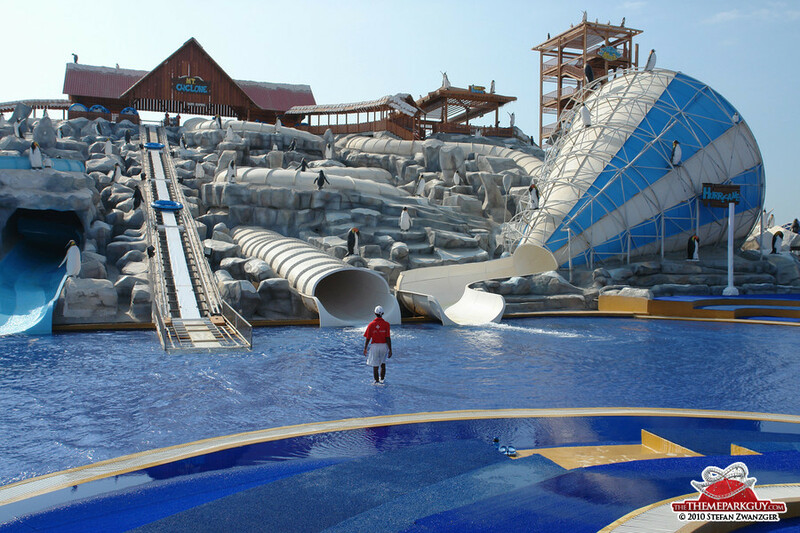 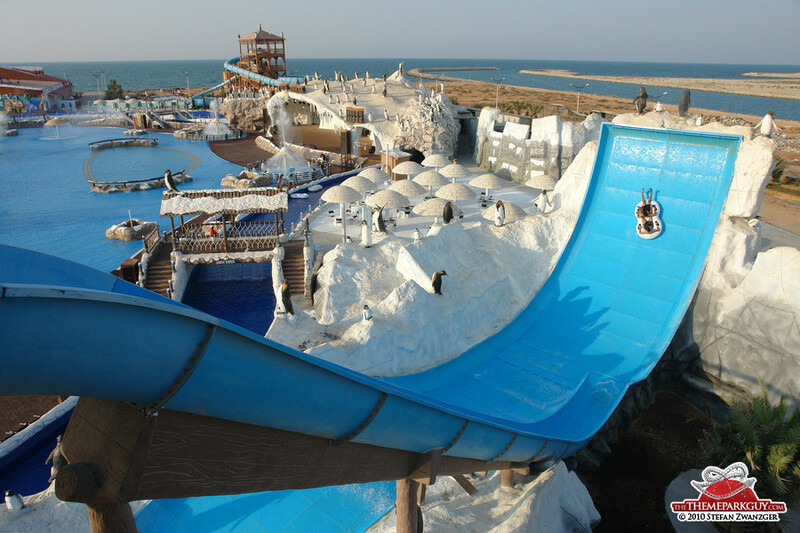 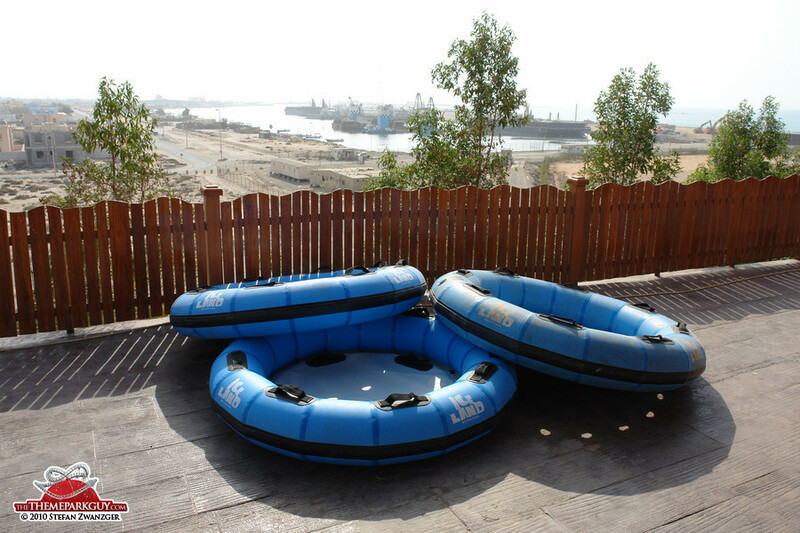 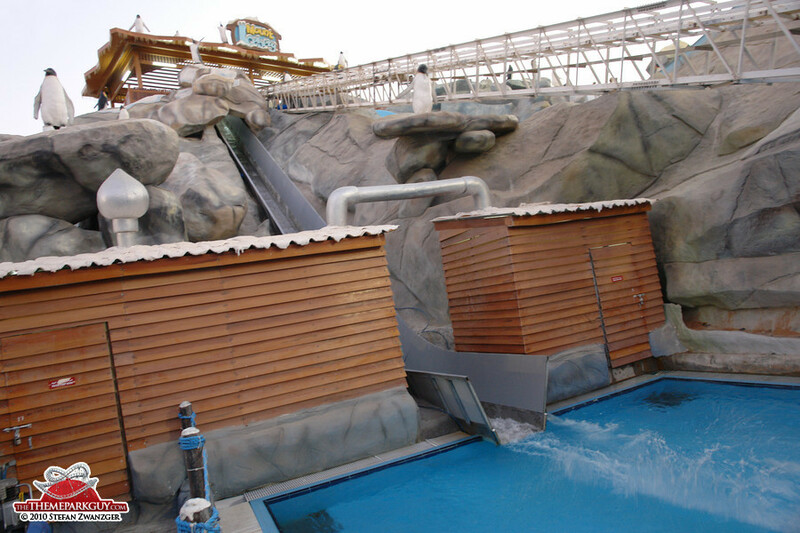 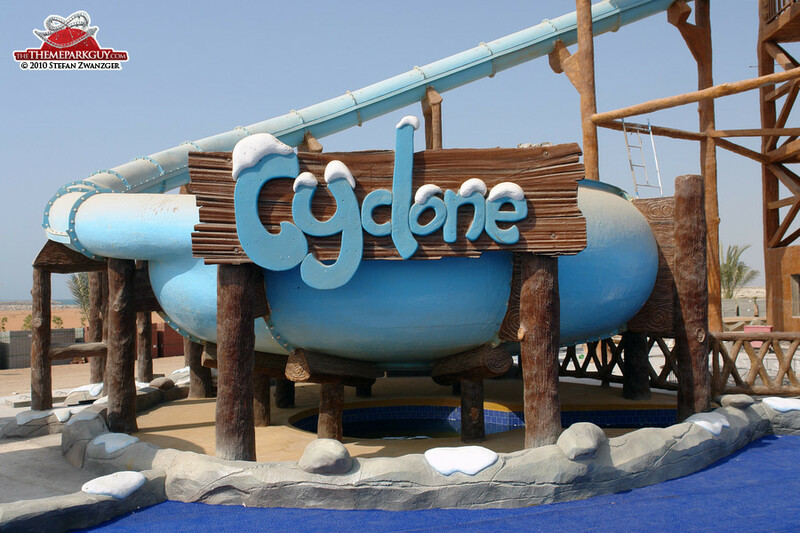 Ice Land is a beautifully-decorated, colossal water playground with a massive amount of slides, and the enchanting contrast with Ras Al Khaimah's harbor and desert landscape puts this venture up there with the most atmospheric theme parks. 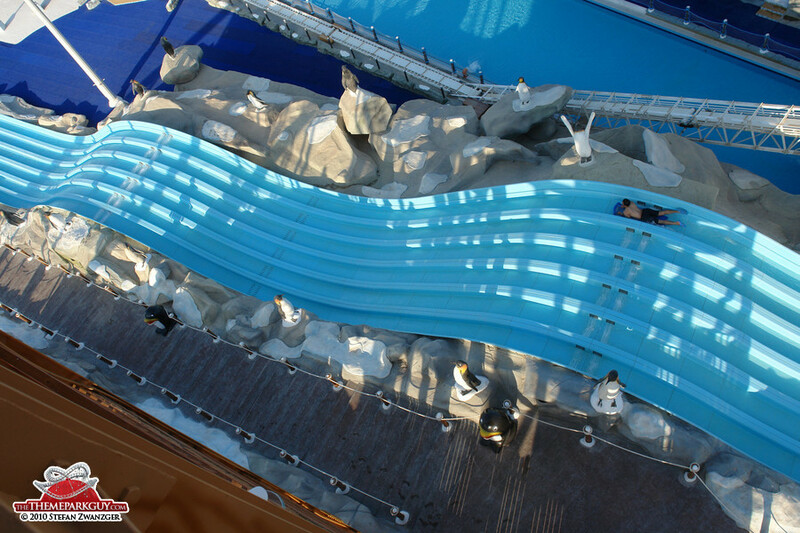 My favorite slide is the ‘Aqua Shute' that has you bounce across the water's surface like a skimmed little stone all the way to the end of the long splash pool. 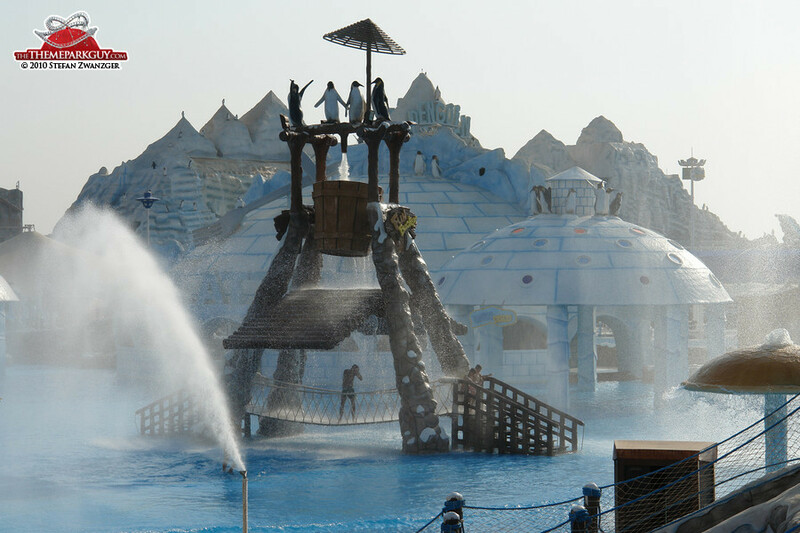 Laudable, as well, is the generous addition of unusual water park features like a full-size swimming pool, a massive waterfall to cool down beneath and a huge water soccer field. 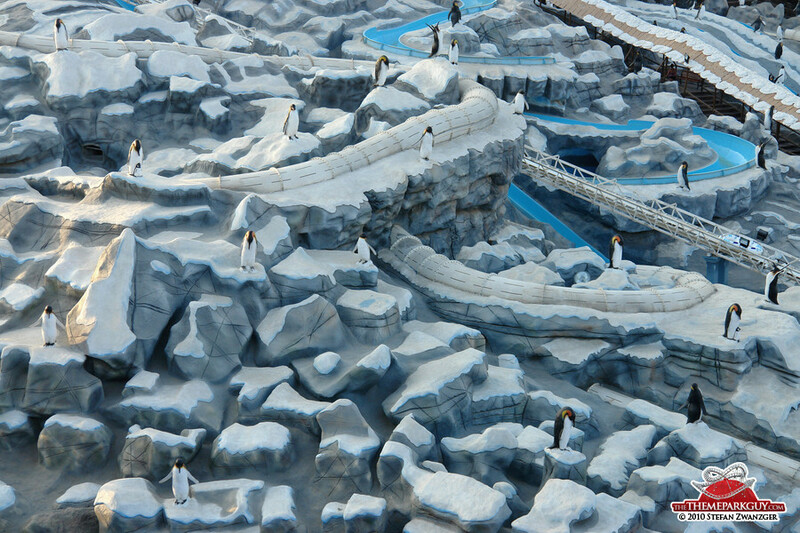 The whole thing feels like a grandiosely loony, penguin-infested H2O-test ground hallucination in the middle of nowhere. 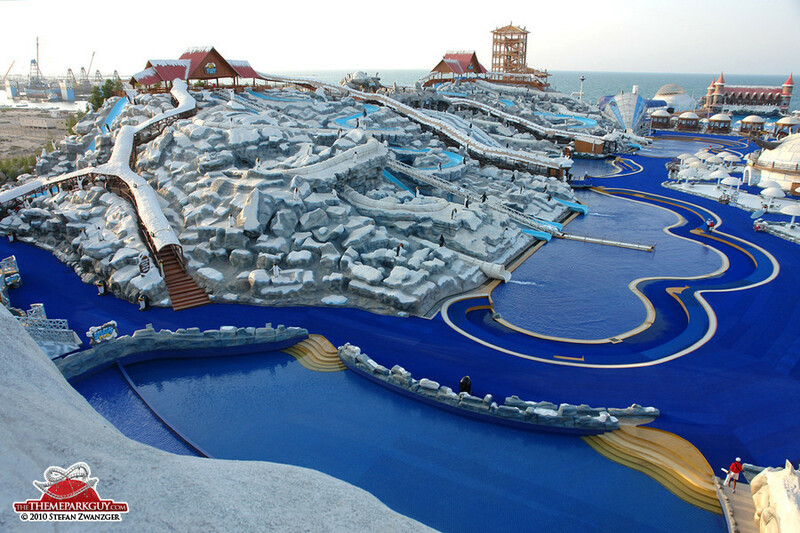 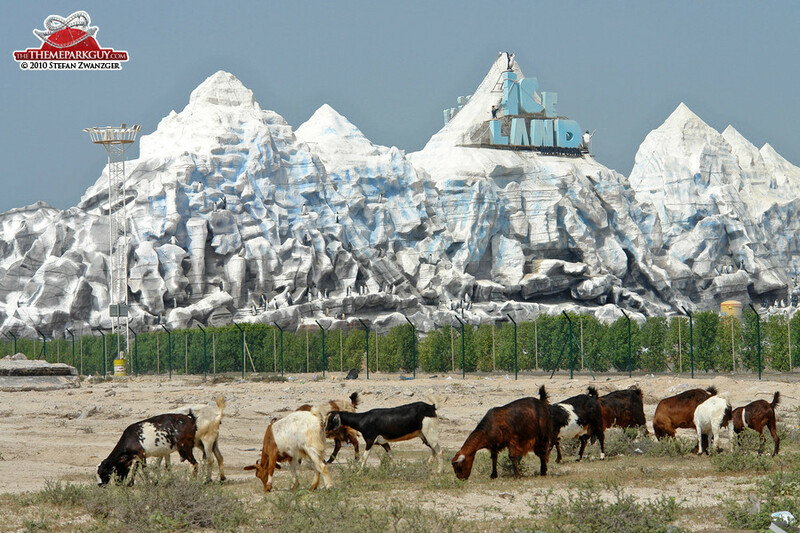 Ice Land greets you with thousands of plastic penguins portraying every possible emotion a penguin can have - what a grandiosely gonzo impression when you picture the contrasting walled Middle Eastern villas surrounding it. 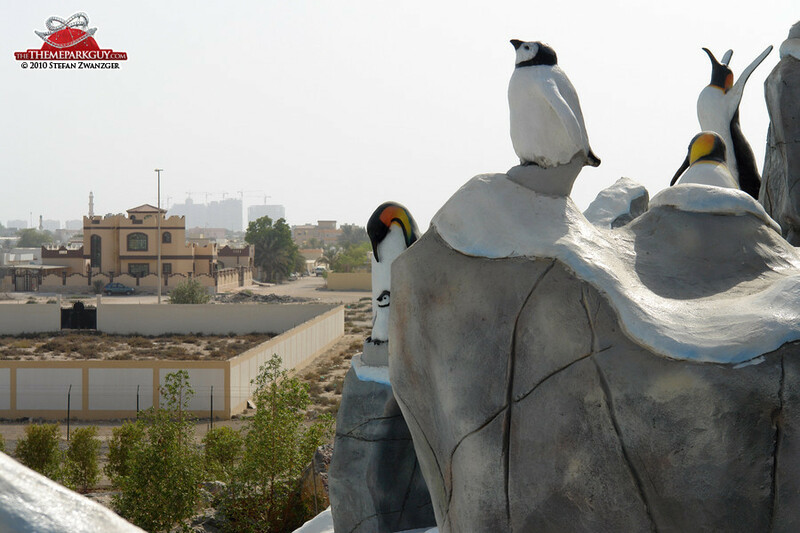 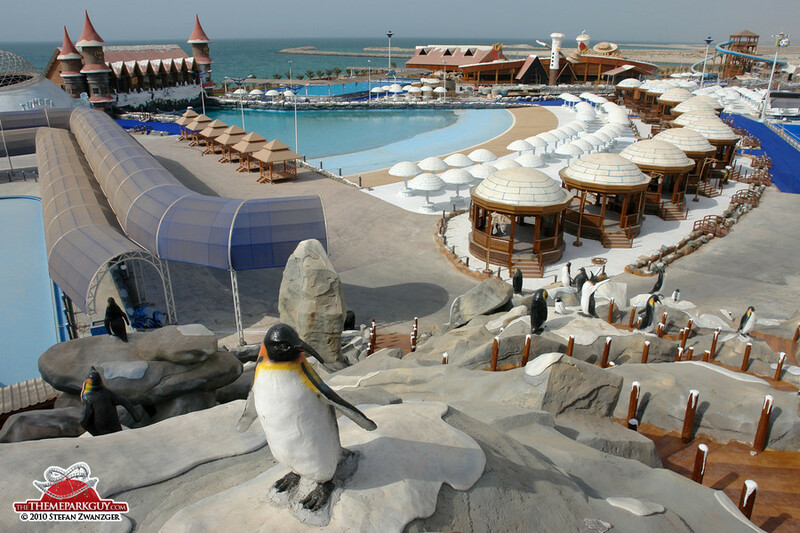 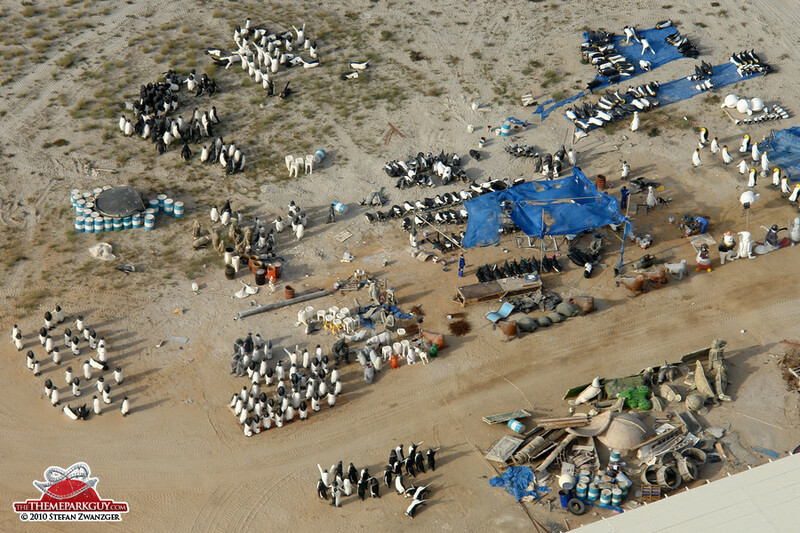 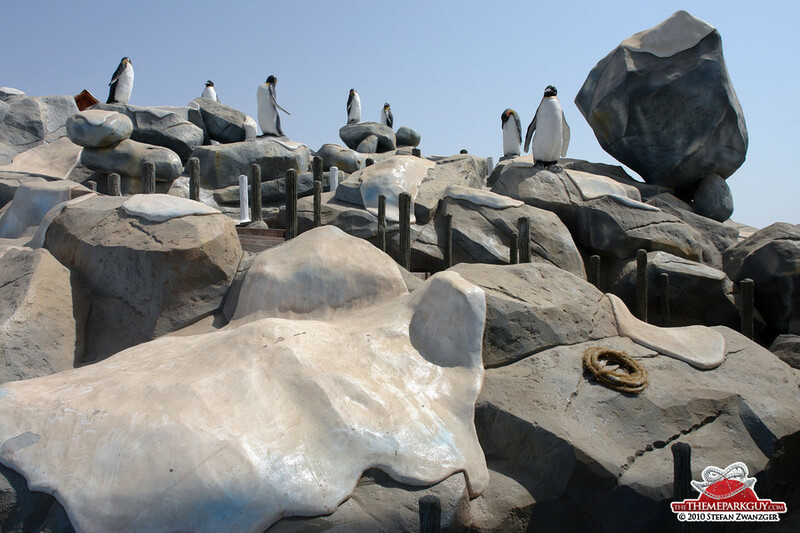 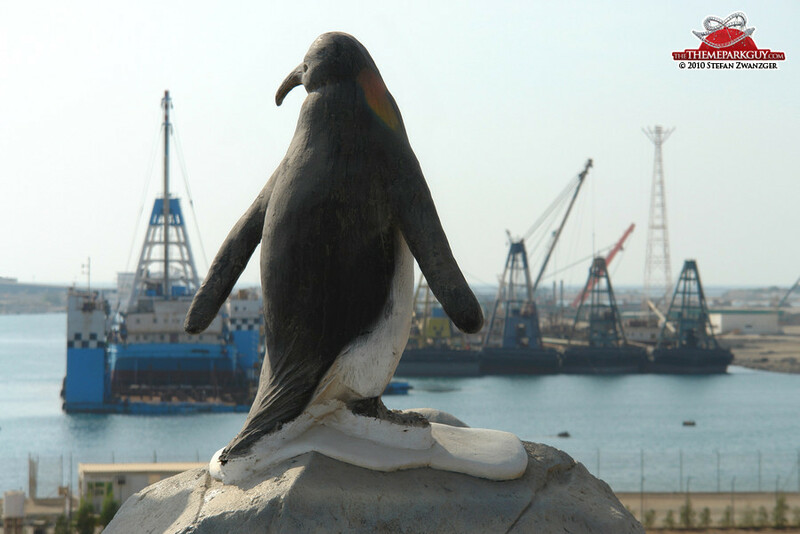 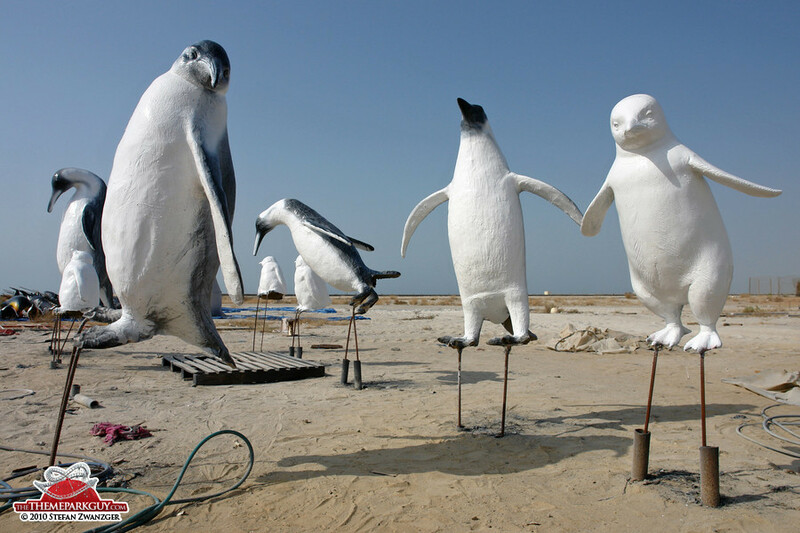 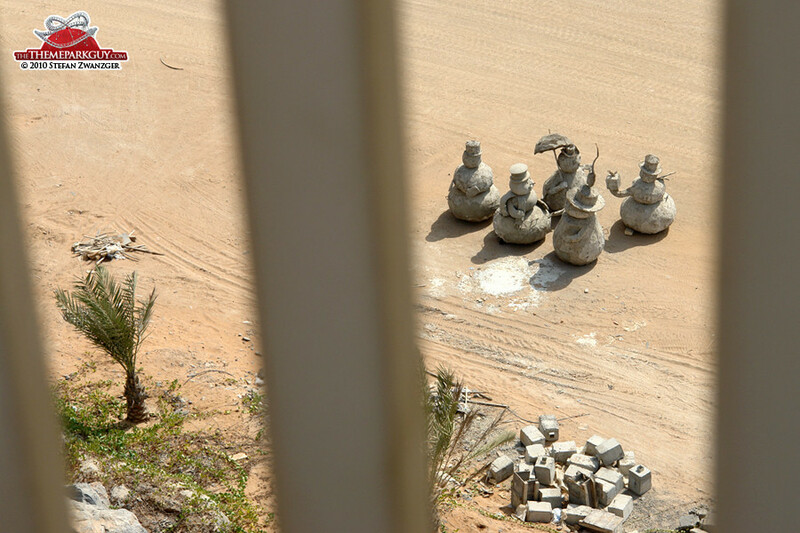 There are more penguins in the park than people on the street, creating an artificial vitality that elevates this venture to the status of a missing city center in this remote outpost of RAK. 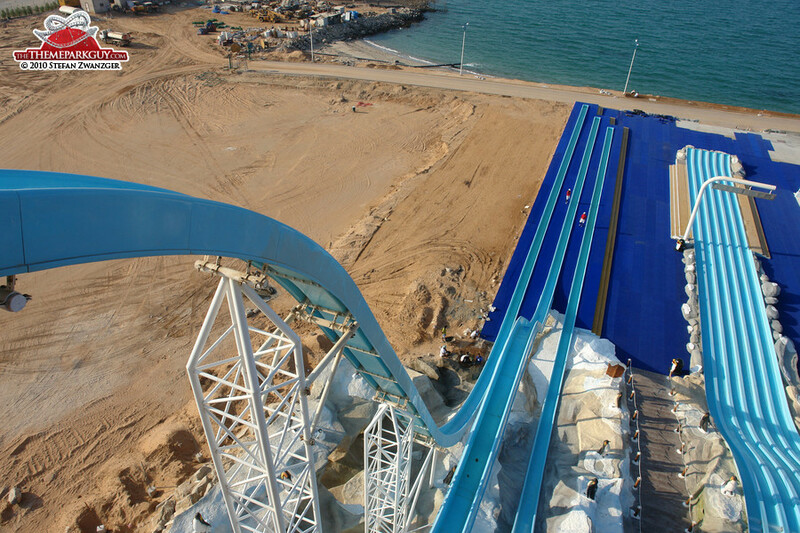 Now that is a vision! 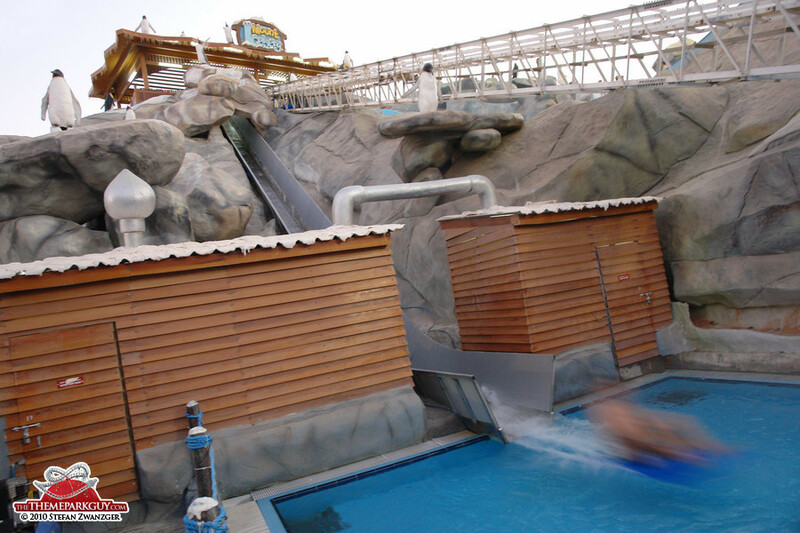 Great care has been lavished on the theming of this water park, which features, amongst a huge variety of slides, a couple of uncommon attractions including a full-size swimming pool, a water soccer field and a massive waterfall capable of cooling visitors in their hundreds. 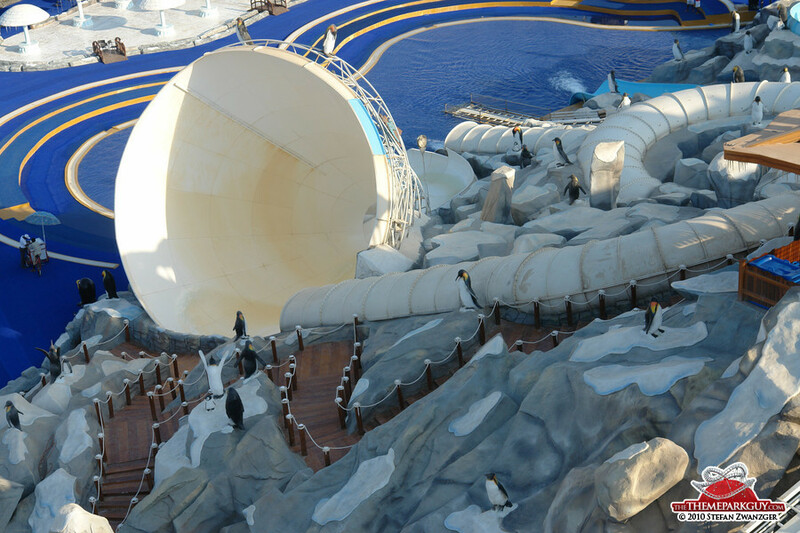 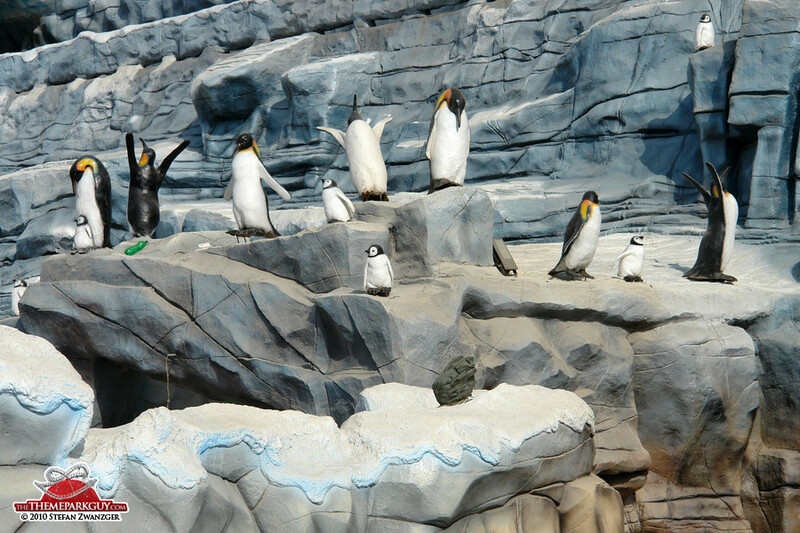 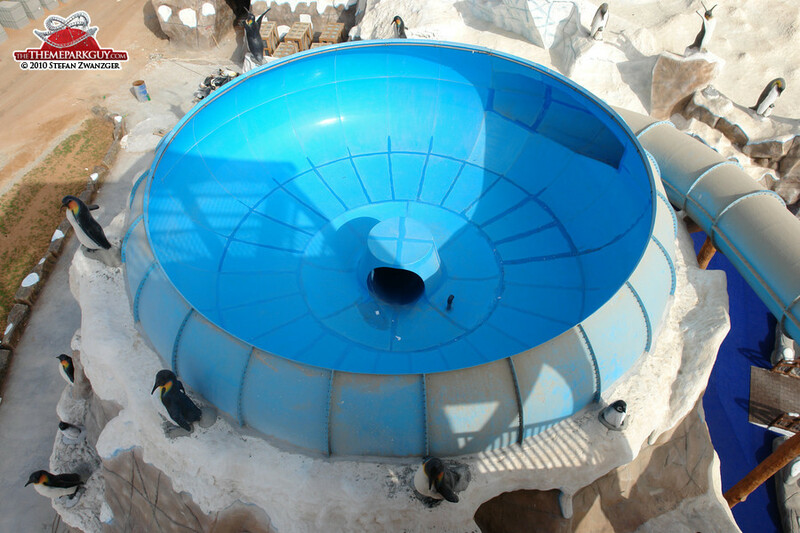 I was told that 15 September 2010 will be the day when this remarkable penguin plunge portal will finally open. 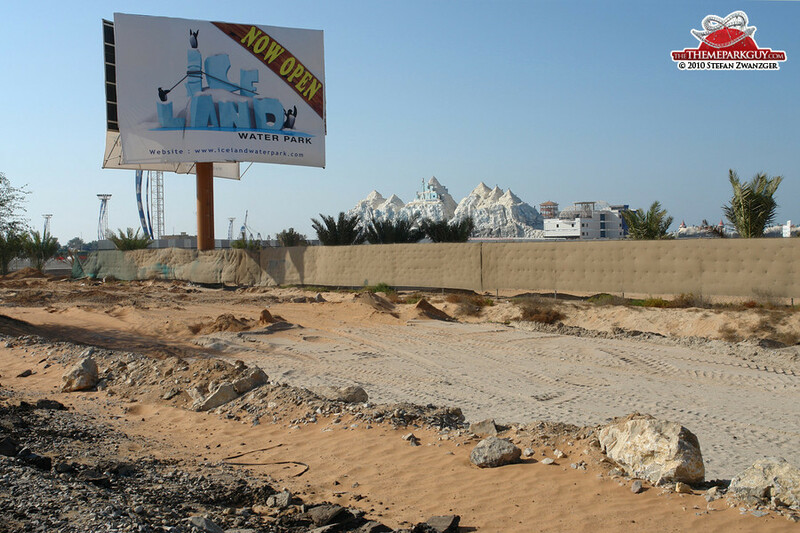 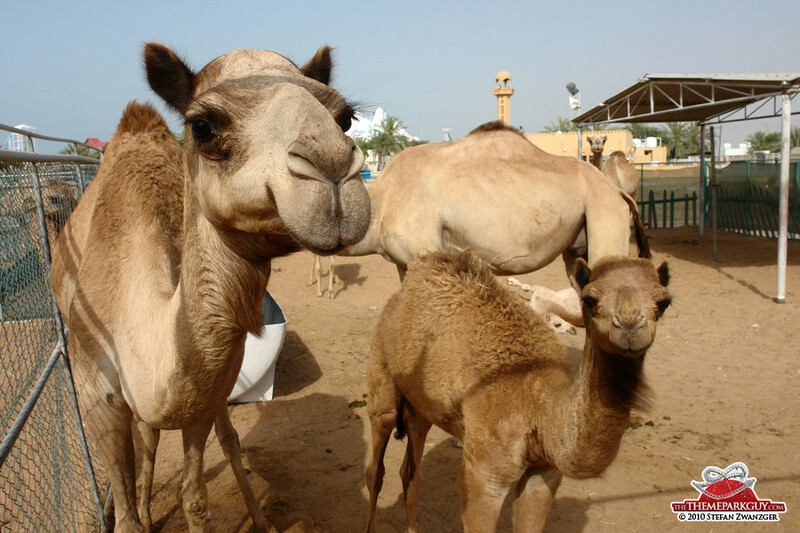 Take Emirates Road from Dubai up north, drive one hour until the T-crossing, turn left and you will witness something that makes even the hardest camel drop. 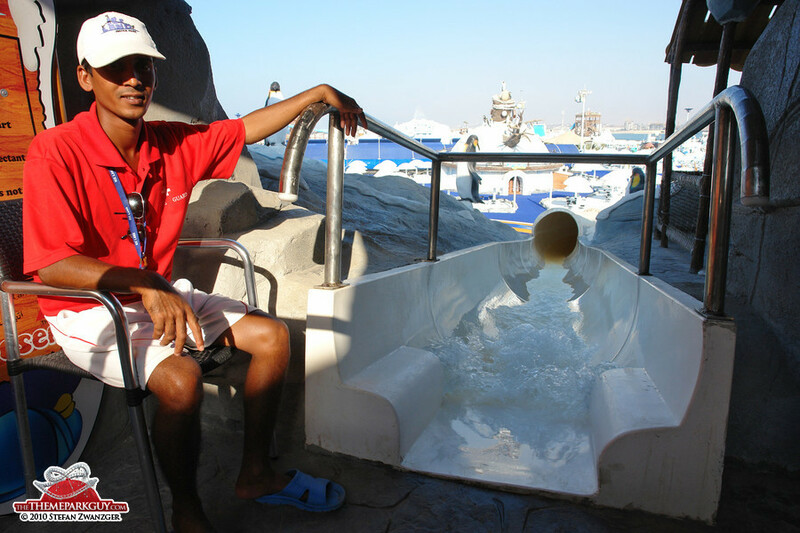 Thanks to the Chawla family for letting me in. 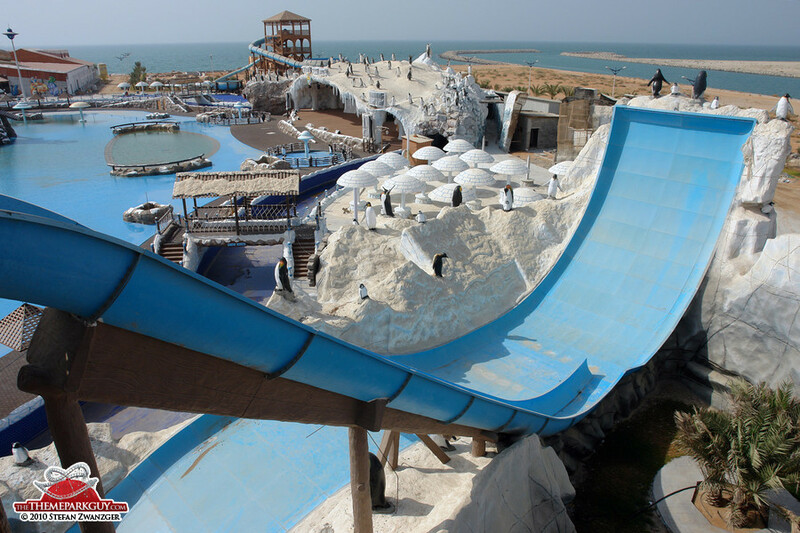 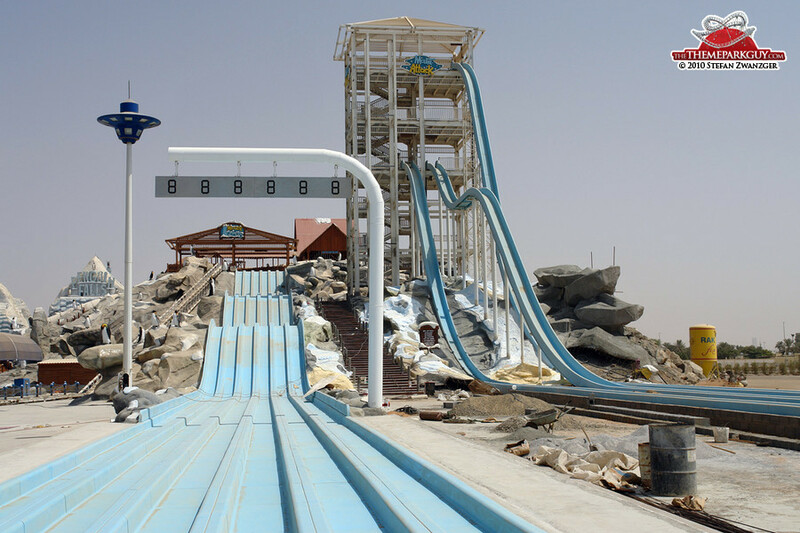 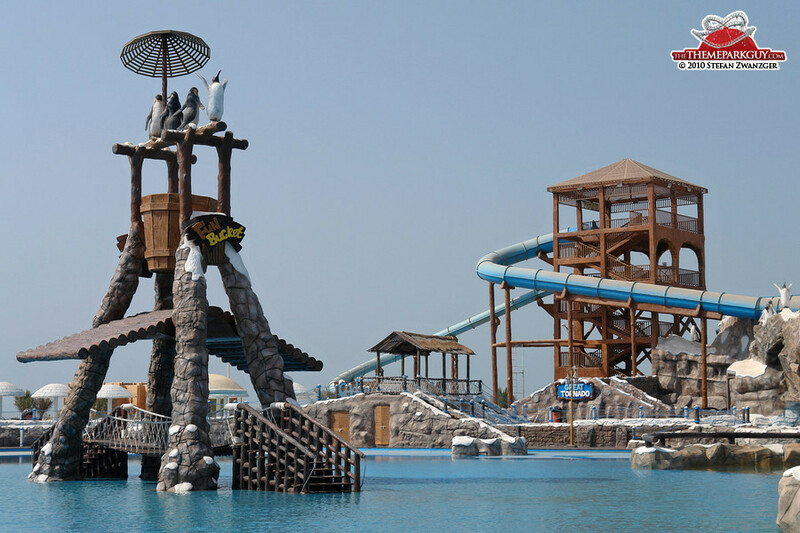 This soon-to-open water park has been rising slowly from the sands of the northern Emirate of Ras Al Khaimah over the past four years and has gone nearly unnoticed by the press and UAE residents. 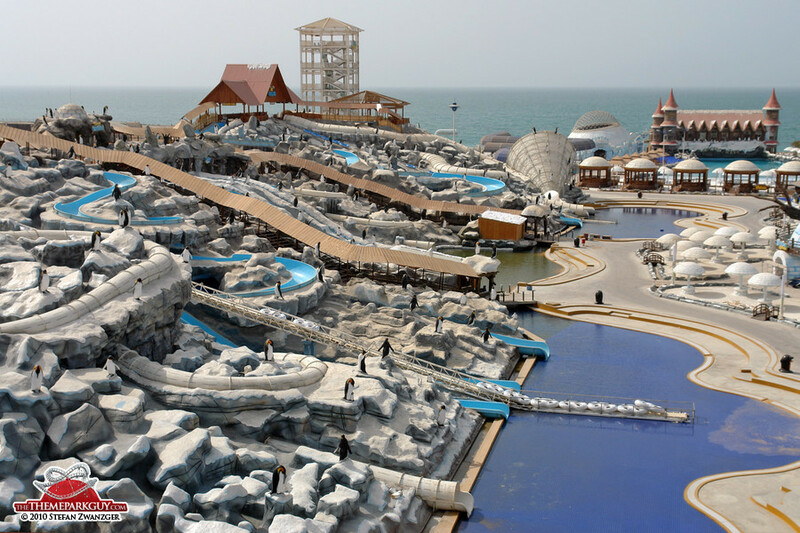 RAK may sound remote and far-away, but it's just over one hour's drive north of Dubai. 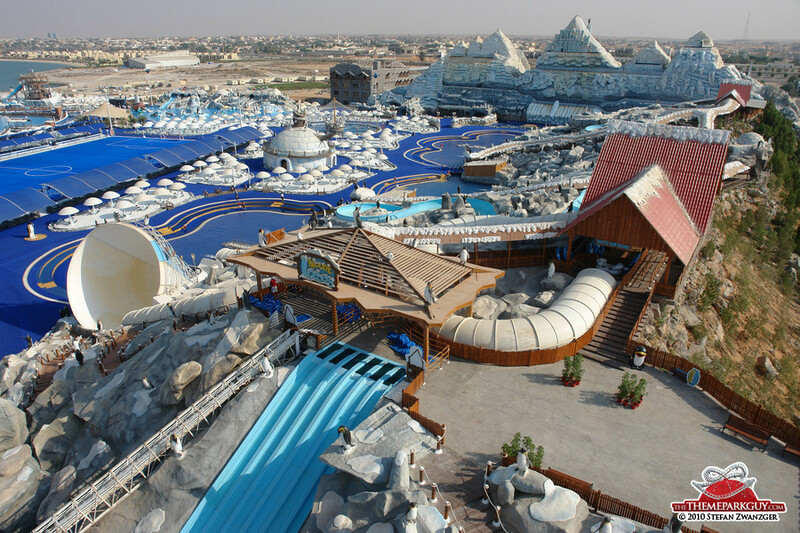 The owner is an Indian theme park lover who runs three other water parks, two in India and one in Uzbekistan. 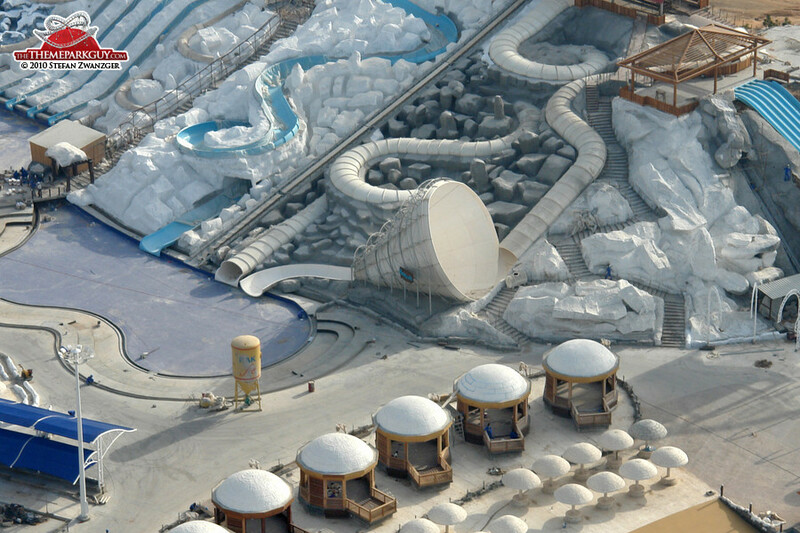 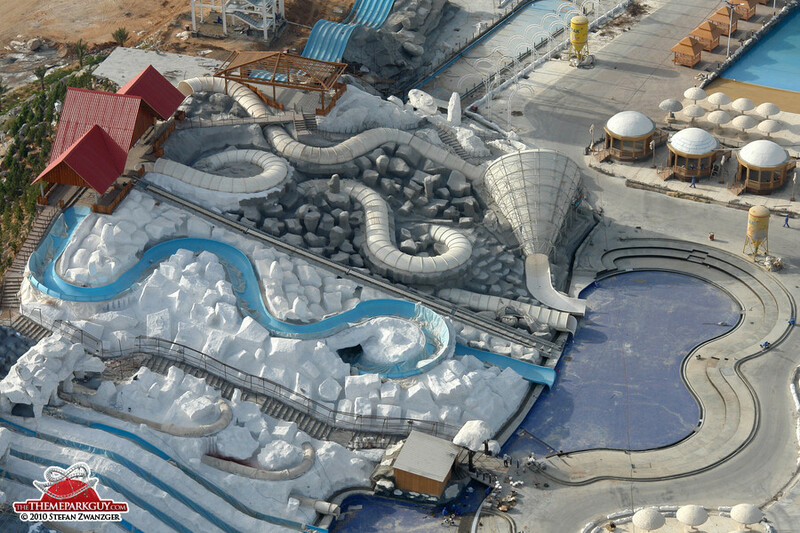 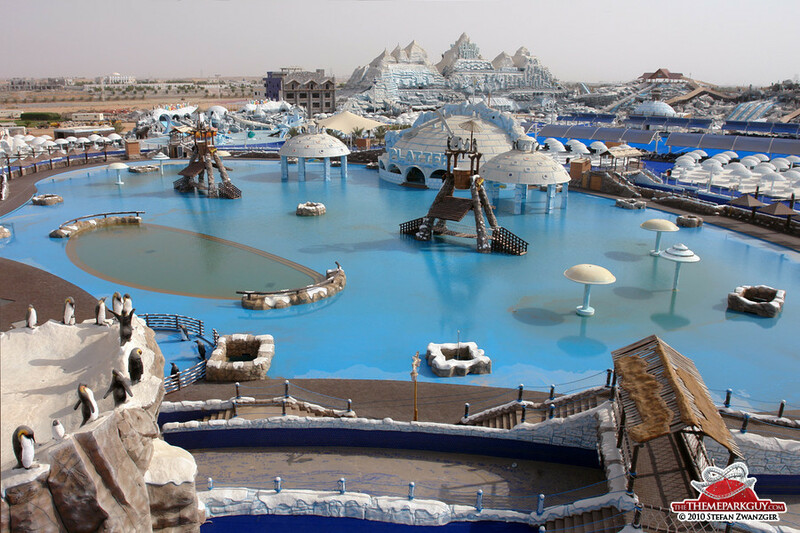 Ice Land Water Park is clearly inspired by Disney's Blizzard Beach, but the setting of this global warming-themed splash garden in the Arabian Desert gives it an absolutely unique character. 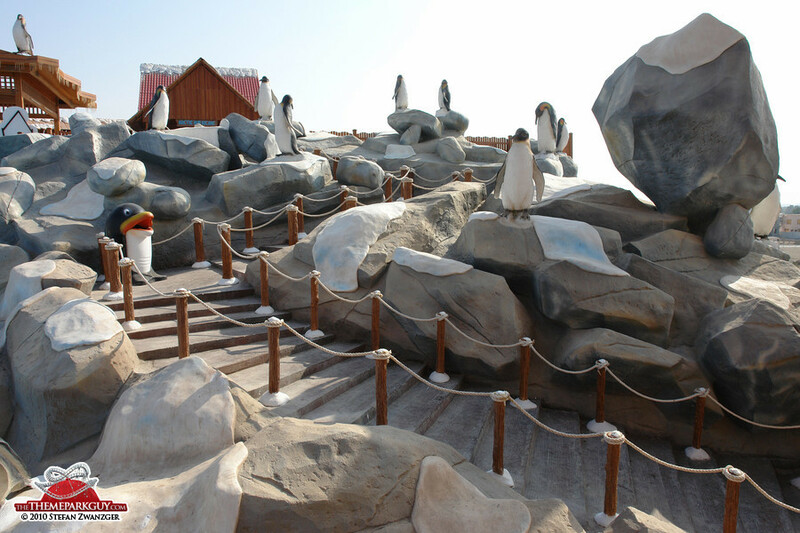 The presence of several hundred plastic penguins against this barren red landscape is a surreal vision of the future. 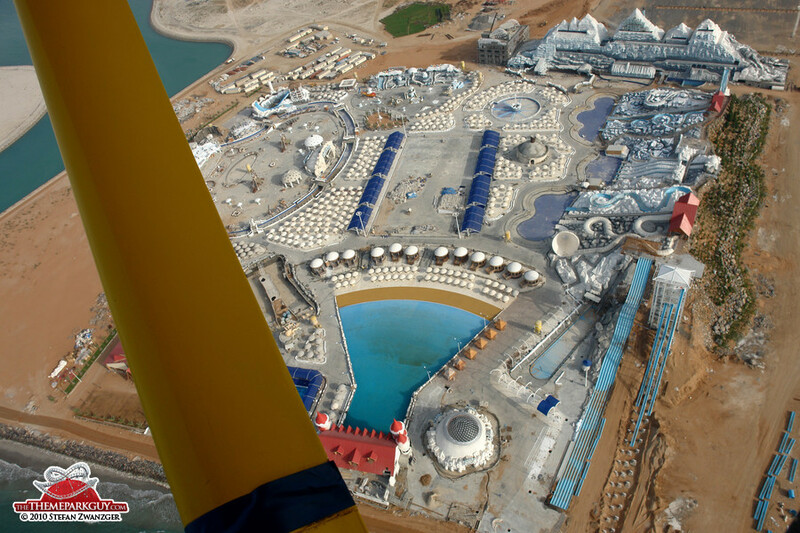 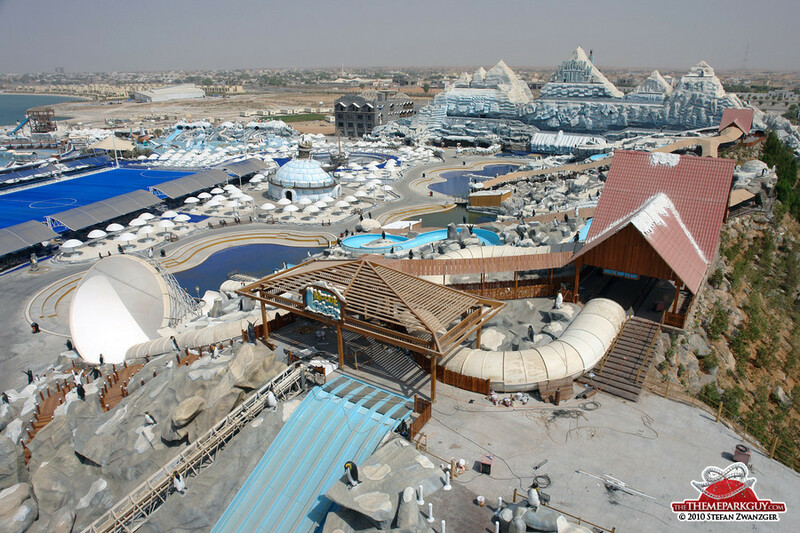 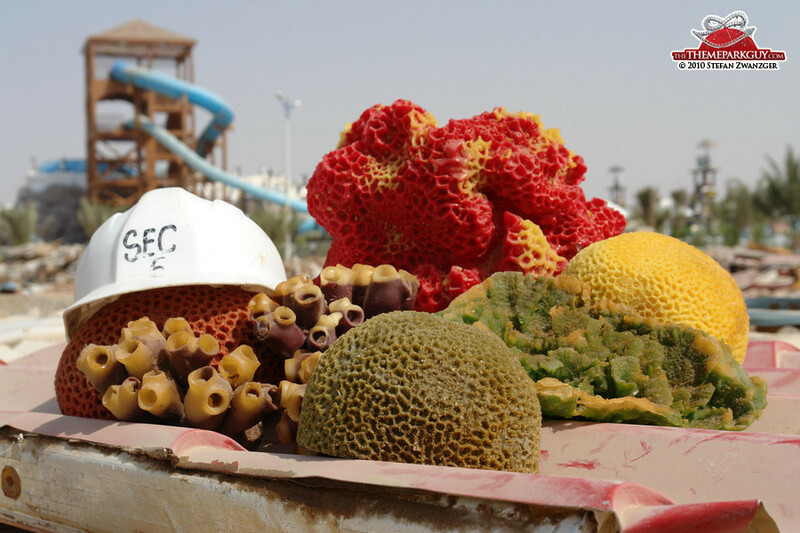 First-generation family enterprises in today's theme park industry are rare and having the courage to develop ambitious water parks in Uzbekistan and a place like RAK deserves praise. 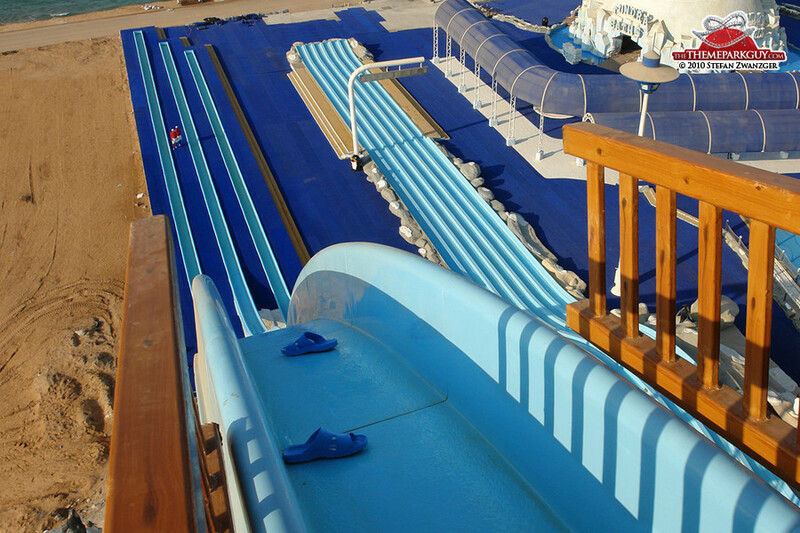 The slides are manufactured in house, no Canadian imports, so I hope they are gonna be good!